This soundbar and wireless subwoofer comes in super-slim package at a budget price for those wanting to hear what they've been missing from their TV’s built-in audio. Measuring only 2.1 inches tall, 35.4 inches wide, and 3.2 inches deep, the Polk Signa S1 is designed to be heard, not seen. In that tiny footprint, Polk has packed a multi-driver array consisting of two 1.25-inch drivers, a 4.4-inch wide oval midrange driver, and two 1-inch tweeters. You can wall mount the 11.35-pound Signa S1 with screws thanks to its keyhole hanger. There’s no special mounting hardware needed. Of course, you can also place the soundbar on top of or inside a cabinet.The benefit of such a slimline soundbar is that it won’t block your TV’s IR remote sensor should you put the soundbar on top of a cabinet with the TV immediately behind it. Taller soundbars have the potential to block your TV’s remote control port. Unfortunately, there are no EQ options to help adjust the soundbar’s sonics for those different placements that can adversely impact the midrange and bass. 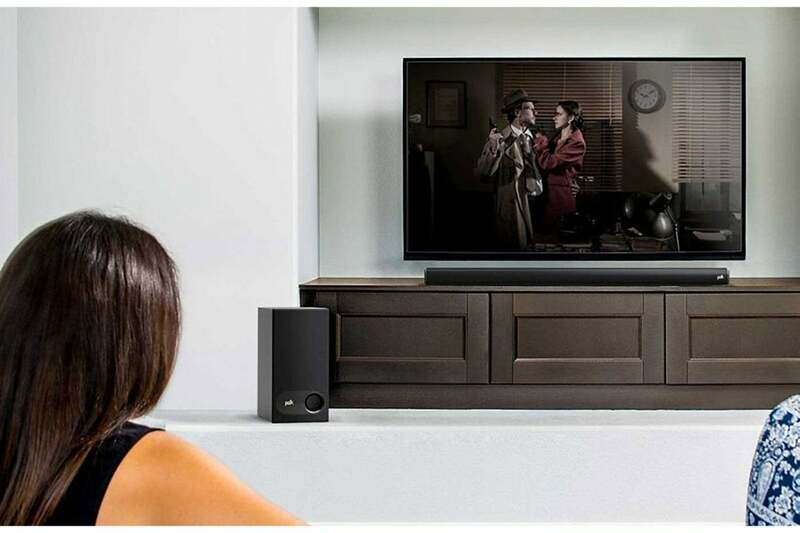 The complementary subwoofer connects wirelessly to the sound bar. Polk anticipates consumer technophobia. The subwoofer comes pre-paired with the sound bar when you unbox the unit. Should the pairing go awry, the process to re-pair the sub with the sound bar is straightforward. The sub’s 5.25-inch driver is enclosed in a slimline cabinet measuring approximately 13.4-inches tall by 6.7-inches wide by 12.3-inches deep. The subwoofer is ideal for tucking away next to a couch or in a corner. A 5.25-inch driver won’t do much in a large room nor will it have the ability to dig down to reproduce deep bass notes. Nevertheless, Polk rates the total system response to reach down to about 45Hz, which is equivalent to the frequency range from a good pair of monitor loudspeakers. 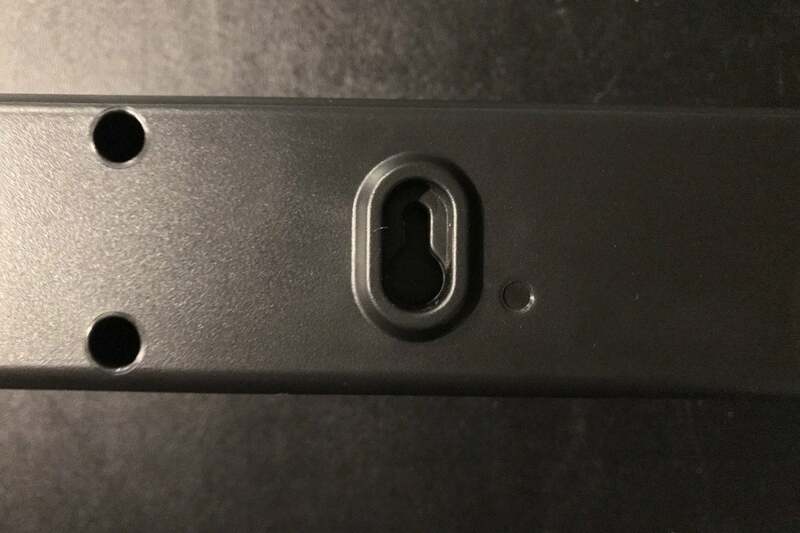 ou can wall-mount the soundbar with the keyhole mounts on the rear. 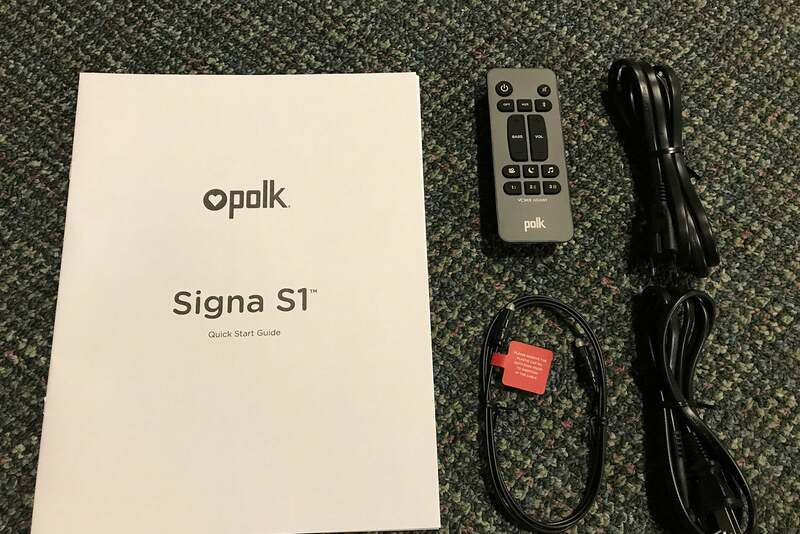 The Polk Signa S1 comes with four different modes. Movie mode is said to enhance the sound bar’s audio reproduction for TV and movies; music mode is for music content or programming with music; the night effect mode reduces bass, reduces program dynamics, and boosts dialog intelligibility for low-volume listening; and voice adjust isolates the voice channel to boost dialog. Setting up the Signa S1 is simple and straightforward. You run either a Toslink optical cable (included) from your TV to the soundbar or an analog 3.5mm-to-RCA stereo cable (not included). In this configuration, be sure that your TV is set for external audio or the internal speakers speakers are turned off. Double-check your TV's user manual or you might get sound from both the soundbar and the TV's internal speakers. There’s no HDMI port with audio return channel (ARC) or other HDMI inputs on the soundbar. Therefore, you’ll need to connect all your audio sources to your TV and then use your TV’s input button to switch between them. The Signa S1 has a digital Toslink optical input and a 3.5mm analog AUX input. Most soundbars at this price point come with Bluetooth streaming only. The Polk Signa S1 is no different. Activating a Bluetooth connection with the Polk Signa S1 soundbar displays a solid blue LED light on the front of the cabinet. Speaking of the Polk's LEDs, the series of four lets you know what’s happening. 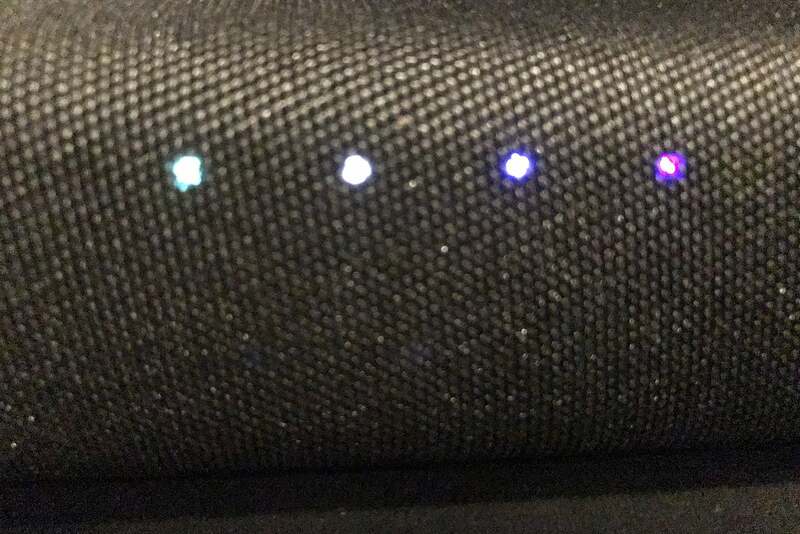 A single white LED glows to let you know the soundbar is set to its optical connection. Two white lights indicate the input is set to the auxiliary analog input. A single green light means the soundbar is receiving an audio signal encoded with Dolby Digital, and a single purple light let’s you know one of the soundbar’s four audio modes is active (movie, music, night effect, or voice adjust). 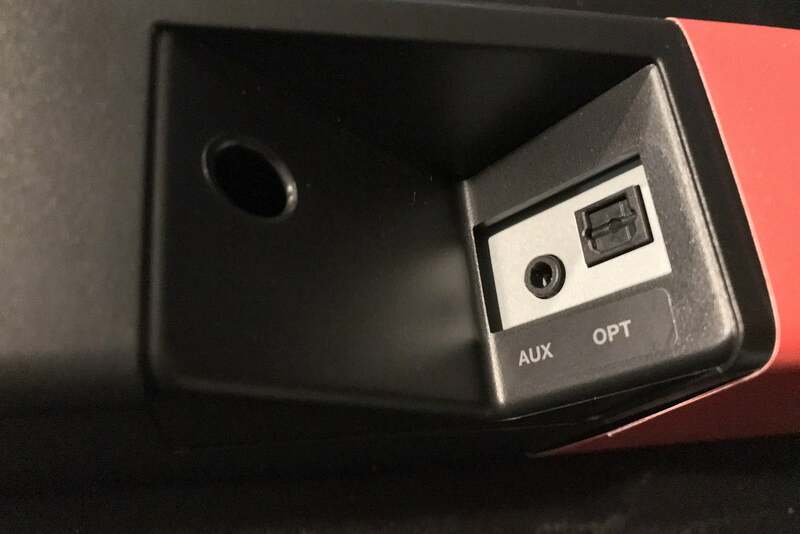 There are four LED lights on the front of the soundbar indicating different functions. These indicators aren't as good as they could be. The purple light, for example, is far too dim to be seen easily in daylight conditions. Even in a fully darkened room, the purple LED was difficult to see because it's dimmer than the white LED and only blinks on for a fraction of a second before turning off again. I found myself dismissing the front LED lights altogether and instead trusted my ears to tell me what was going on. While it’s easy to play armchair product designer, the fact remains that this is a very reasonably priced soundbar and it can be unfair to expect lots of bells and whistles. Most soundbars at this price point come with a cheap, thin, credit-card style remotes. The Polk thankfully breaks that trend. The Signa S1’s remote fits nicely in your hand. It is logically laid out with tactile buttons of different shapes and sizes so you can navigate it without looking. There are independent toggle-inspired buttons for volume and adjusting the bass volume. There’s no way to tell the actual volume of either, however, and there isn’t an easy way to reset the bass volume to its default. The only feedback you get is via the soundbar’s single front LED. The Signa S1 comes with the basic accessories you need to set things up. I found the remote to be a bit finicky. I had difficulty getting remote commands to work once I started to get past about 20- to 30 degrees off center. Even when I was on-center, there were a few times I had to press the remote a second time for a command to stick. To be fair, perhaps I was more attuned to these issues after using the Vizio SB3651-E6 Smart Cast soundbar’s exceptional IR remote. The Polk Signa S1 was a piece of cake to set up. I tested the speaker/subwoofer combo in my home theater space, where I have a dedicated 7.2.6 Dolby Atmos and DTS:X immersive audio setup. Because I’m in the middle of reviewing a Marantz SR7012 A/V receiver, I found it easier to connect my Oppo UDP-203 UltraHD Blu-ray player directly to the Polk Signa S1 soundbar with a Toslink optical cable. While the Signa S1 comes with a super-thin four foot Toslink Optical cable, I used my six foot Audioquest optical cable instead, because the included cable was one foot too short to reach to my audio equipment rack. For most uses, the Toslink’s four-foot length will be more than enough because as I mentioned above you’ll typically feed the soundbar from your TV’s Toslink optical output. I used an Audioquest Toslink optical cable to connect the Signa S1. Connecting the soundbar via Bluetooth to my iPhone was just as easy. The audio streaming is there as a nice convenience should you need it, but it can’t be expanded to be part of a whole-home streaming setup. I really wish that this soundbar came with DTS Play-Fi like Polk’s Omni S6 wireless speaker that I previously reviewed. Including DTS Play-Fi would have made this soundbar an unbelievable value. Powering up the system took approximately 10 seconds before any sound would come out. I found that to be a comparatively long wait so I powered the soundbar off and then on again a few times and noticed the same initial delay. Be warned, your TV will most likely be on and playing before the sound kicks in. For the money, the Signa S1 has an amazing ability to render dialog more intelligible. 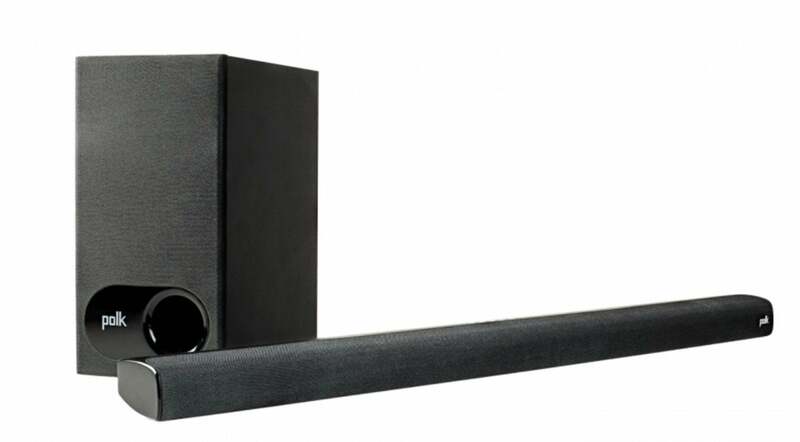 On the downside, the Polk Signa S1’s weaknesses are similar to other soundbars at this price point: Compressed dynamics, lack of top end sizzle, and a good but not authoritative bottom end. Playing Star Wars Rogue One gave the Polk a run for it’s money, revealing both its strengths and weaknesses. Clean dialog was a decided strength. Actors' speech was easy to understand across a variety of content. And if you need to enhance it even further, the Polk comes with three dialog-enhancement settings, which it calls Voice Adjust. When Director Orson Krennic has his ominous audience before Darth Vader in Chapter 27, for example, both Vader’s and Krennic’s voices were pristine against John Williams’ score and the soundtrack's background sounds. 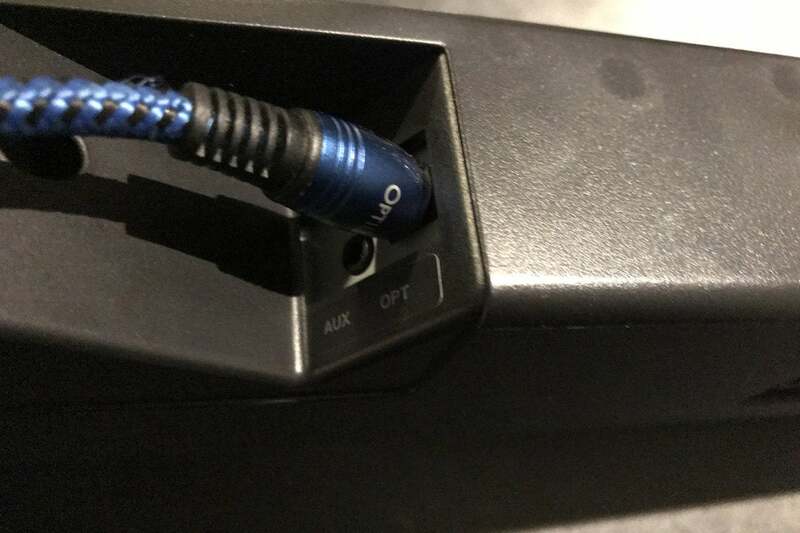 The top of the soundbar has buttons for all basic functions. Activating each of the three Voice Adjust settings made Vader’s and Krennic’s voices even more pronounced. The way all these voice enhancement systems work, however, is by boosting frequencies within its particular range and de-emphasizing some others according to an algorithm. Because the system can’t specifically discern voices from background sounds, the system tends to raise all sounds in the range it is affecting. Consequently, at the two highest Voice Adjust settings voices are certainly clear, but the overall sound becomes unbalanced and artificial. Once again, this isn’t necessarily a knock against the Polk specifically. This is a characteristic that I have noted consistently across many soundbars. Until we can have true object-based dialog adjustment as promised through DTS:X, any voice enhancement technology will fall short of perfection. The Signa S1's slim form factor won't block your TV's IR port when the speaker is placed in front of your TV. Looking to other aspects of the Polk’s performance, the top end was rolled off. Cymbals lacked realistic sizzle and horns were robbed of their luster and dynamics. Returning again to Rogue One, Chapter 27, for example, when Krenic visits Darth Vader on Mustafar: The scene opens with a wide-angle view of the volcanic planet. Director Krennic’s shuttle buzzes across the sky as John Williams’ ominous score takes center stage. The Polk just couldn’t reproduce the full impact of John Williams beautiful score as I’ve experienced in my reference system or through more expensive soundbars. My listening space is quite large—about 24 feet by 13 feet with an opening to the right side and rear. When I turned up Polk’s volume, I noticed a hint of clipping. In Rogue One Chapter 32, “10 men like 100,” for example, Jyn Erso and Cassian Andor are addressing the rebel assault team before reaching Scarif. Jyn and Cassian’s voices exhibited a bit of harshness at higher volumes that wasn’t present when I had the soundbar playing at lower volume levels. I also tested the Polk’s "night" setting, which adjusts the soundbar’s output for late-night listening so you don’t wake up your family or the neighbors. I found the night setting to be highly effective. It normalized and capped the entire audio range but dialogue remained perfectly intelligible as other sounds and frequencies recessed into the background. Not all late-night settings on soundbars work as advertised. In my view, Polk did an outstanding job with this setting. Polk’s Signa S1 soundbar does an excellent job of elevating your listening experience beyond the limitations of your TV’s built-in speakers, and for an extremely modest investment. Chief among its strengths, the Signs S1 does an outstanding job of making voices and dialog clear and intelligible, and it does so in an ultra-slim footprint. The soundbar and wireless subwoofer come with just enough extras to make it a solid value. If you’re on a strict budget and frustrated by your TV’s subpar sound, the Polk Signa S1 should be on your short list to audition. Polk's budget-priced soundbar and wireless subwoofer combo is a smart solution to the problem of bad sound from TV speakers.